Bred to be blind, Pudding had suffered the last few years of her miserable laboratory tenure with painful glaucoma. From pure hell to absolute heaven, Pudding’s story is the reason we are in the rescue business. She teaches us that no matter how long and dark (literally) our troubles can seem, that life is not over until it is. Imagine living in the world under a blanket of darkness… scared of what maybe lurking all around you, uncertain of what lies ahead of each step you take, not knowing where you even are at times. Losing ones vision is one the greatest fears humans have. Now imagine that you are not only blind, but also stuck in a laboratory cage. Your whole world is perceived through sound and smell. The loud clanging of metal doors and cages, the echoes of voices bouncing off cinderblock walls and cement floors, other dogs barking, yelping, and softly whimpering. That powerful beagle nose is picking up only odors of ammonia, urine, blood, and fear. Meet Pudding, this was her life. 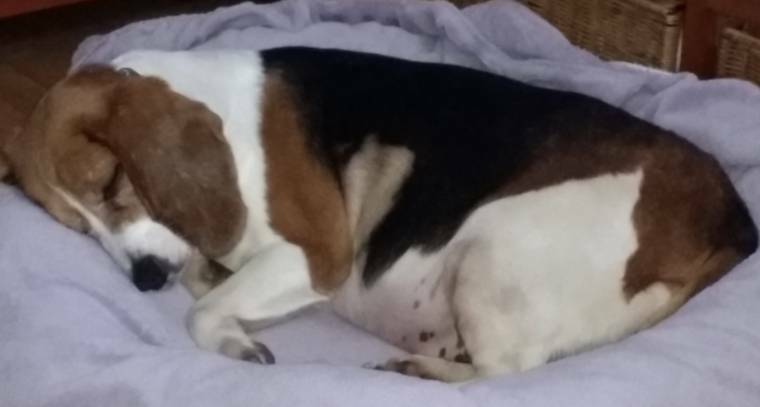 This senior sweetie spent 10 agonizing years as a “fuzzy little test-tube” for experiments. 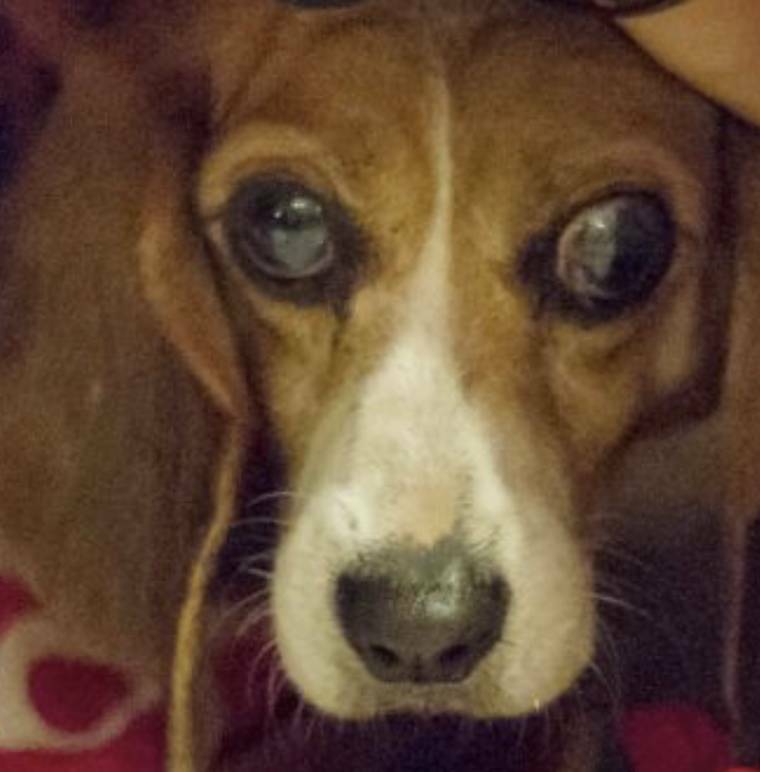 Bred to be blind, she has suffered the last few years of her miserable laboratory tenure with painful glaucoma. She could no longer even see the white-gloved hand reaching in to grab her by the scruff of her neck… maybe that was a blessing, blacking out such an ugly world. As anyone who has experienced glaucoma knows, it is anything but pleasant. The disease took not only her vision, but has also afflicted her with debilitating migraine headaches. For years in that laboratory there was no relief, only the cold grated floors of her metallic cage. Pudding was in hell. 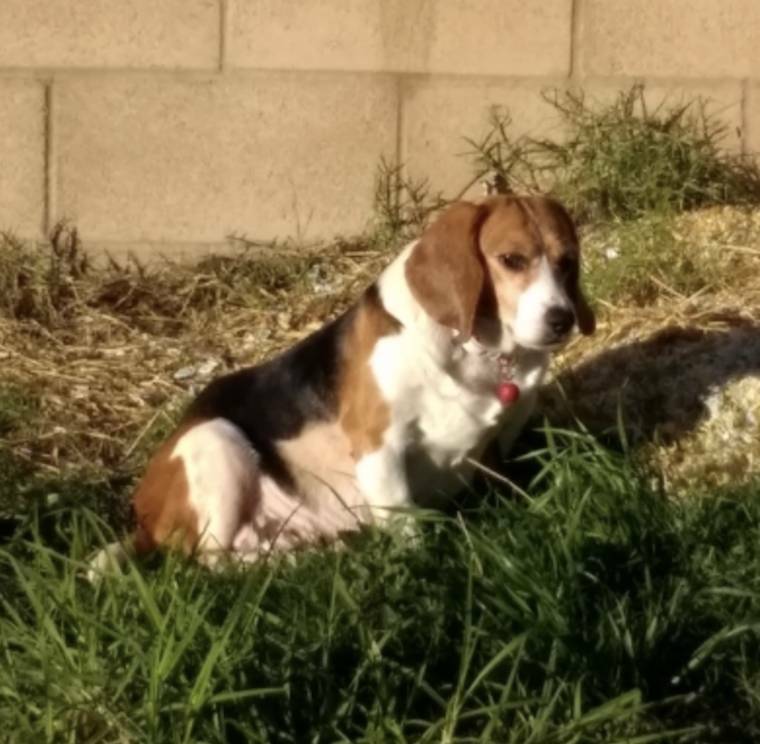 Rescued from experimentation with the Beijing Beagles, Pudding made her way to the U.S. and a new chance at what is left of her precious life. While she cannot enjoy the magnificent sight of that Southern California sun, she can finally at least feel its warmth on her frosted muzzle. Pudding went home, her first ever, on January 11th of this year with an amazing foster Mom, Lori. She was welcomed into a big new animal family that includes cats, three other dogs, and three rabbits rescued by BFP from a laboratory. Lori has reported that our little Pudding is just so sweet (her name is Pudding). She loves snuggling and snoozing in any number of beds. Although she cannot see, she gets around pretty well outside in the yard and really enjoys sniffing around for new beds to plop down into. She is a beagle! After so many years with no name, she has quickly learned hers and greets visitors at the door with the rest of the pack. She loves the company of the other animals, seeks them out, and always has her tail wagging. Despite what she endured in the laboratory, she still likes people. When Lori is cuddling her, Pudding will give little kisses to her fingers with each caress. This sensitive little display of affection is really an incredible gift of forgiveness to humanity. Her veterinary needs are being met. She is scheduled to have both of her eyes surgically removed to stop the glaucoma pain. Unlike in her former life, she will recover and cooperate in comfort! The best part of her new life, Pudding is now pampered! Lori works as a dog groomer and has brought Pudding to work with her. She has been bathed and lavishly fawned over as the beautiful beagle she is. From pure hell to absolute heaven, Pudding’s story is the reason we are in the rescue business. She teaches us that no matter how long and dark (literally) our troubles can seem, that life is not over until it is. If Pudding’s story has moved you please consider adopting a senior dog in your community. There is no shortage of dogs just like this that desperately need love. Please also consider making a tax-deductible donation to help cover Pudding’s veterinary care, she is worth every penny you can give!